For other uses, see Trinidad (disambiguation). The original name for the island in the Arawaks' language was Iëre which meant "Land of the Hummingbird". Christopher Columbus renamed it "La Isla de la Trinidad" ("The Island of the Trinity"), fulfilling a vow he had made before setting out on his third voyage. This has since been shortened to Trinidad. Caribs and Arawaks lived in Trinidad long before Christopher Columbus encountered the islands on his third voyage on 31 July 1498. 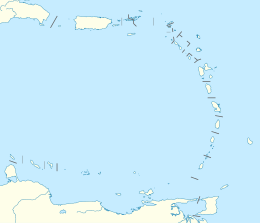 The island remained Spanish until 1797, but it was largely settled by French colonists from the French Caribbean, especially Martinique. In 1889 the two islands became a single British Crown colony. 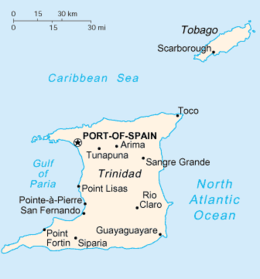 Trinidad and Tobago obtained self-governance in 1958 and independence from the United Kingdom in 1962. Major landforms include the hills of the Northern, Central and Southern Ranges (Dinah ranges), the Caroni, Nariva and Oropouche Swamps, and the Caroni and Naparima Plains. Major river systems include the Caroni, North and South Oropouche and Ortoire Rivers. There are many other natural landforms such as beaches and waterfalls. Trinidad has two seasons per calendar year: the rainy season and the dry season. El Cerro del Aripo, at 940 metres (3,084 ft), is the highest point in Trinidad. It is part of the Aripo Massif and is located in the Northern Range on the island, northeast of the town of Arima. The demographics of Trinidad and Tobago reflect the diversity of this southern-most country in the West Indies. It is sometimes known as a "rainbow island" or more fondly "a callaloo" (local dialect for a delicious dish prepared by blending a variety of ingredients). There is a wide range of ethnicity, religion, and culture. The variety of denominations has followed this pattern for decades: Protestant 32.1% (Pentecostal/Evangelical/Full Gospel 12%, Baptist 6.9%, Anglican 5.7%, Seventh-Day Adventist 4.1%, Presbyterian/Congregational 2.5%, other Protestant 0.9%), Roman Catholic 21.6%, Hindu 18.2%, Muslim 5%, Jehovah's Witness 1.5%, other 8.4%, none 2.2%, unspecified 11.1%. Religion in Trinidad and Tobago consists of a diverse array of denominations including Roman Catholic, Anglican, other Christian denominations, Hindu and Muslim faiths. There are a minority of people who are followers of Traditional African religions, Afro-American religions, Orisha (Yoruba), Amerindian religions, Judaism, Sikhism, Jainism, Chinese folk religion (Confucianism and Taoism), Buddhism, and Bahá'í. Catholicism constitutes the largest religious denomination of the country. As of the 2011 Trinidad and Tobago Census, the population was 35.43% East Indian, 34.22% African, 7.66% Mixed – African and East Indian, and 15.16% Mixed – Other. Venezuela has also had a great impact on Trinidad's culture, such as introducing the music style parang to the island. Many groups overlap. For example, a "Dougla" is a person of African and East Indian descent who may identify as being part of either group. There are multiple festivals featuring the music of the Caribbean and the steelpan, which originated in Trinidad and is the country's national instrument. These festivals include the world-renowned Carnival, J'ouvert, and Panorama, the national steel pan competition. Trinidad also has many public holidays, such as Indian Arrival Day, Emancipation Day, Independence Day, Republic Day, Labour Day, Boxing Day, New Year's Day, Divali, Phagwah, Eid al-Fitr, Corpus Christi, Good Friday, Easter, Easter Monday, Christmas, and Spiritual Baptist/Shouter Liberation Day. There are also places that can be visited that hold cultural significance, such as Mount Saint Benedict and the Temple in the Sea. The island of Trinidad has a rich biodiversity. The fauna is overwhelmingly of South American origin. There are about 100 species of mammals including the Guyanan red howler monkey, the collared peccary, the red brocket deer, the ocelot and about 70 species of bats. There are over 400 species of birds including the endemic Trinidad piping-guan. Reptiles are well represented, with about 92 recorded species including the largest species of snake in the world, the green anaconda, the spectacled caiman, and one of the largest lizards in the Americas, the green iguana. The largest of turtles (the leatherback turtle) nests on Trinidad's eastern and northern beaches. There are 37 recorded frog species, including the tiny El Tucuche golden tree frog, and the more widespread huge cane toad. About 43 species of freshwater fishes are known from Trinidad, including the well known guppy. It is estimated that there are at least 80,000 arthropods, and at least 600 species of butterflies. The economy of Trinidad and Tobago is diversified, based to a large extent on oil, natural gas, industry and agriculture. It is one of the leading gas-based export centres in the world, being the leading exporter of ammonia and methanol and among the top five exporters of liquefied natural gas. This has allowed Trinidad to capitalise on the biggest mineral reserves within its territories. It is an oil-rich country and stable economically. 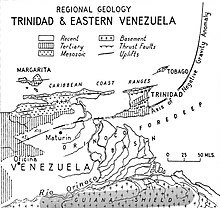 The Venezuela Tertiary Basin is a subsidence basin formed between the Caribbean and South American plates, and is bounded on the north by the coast ranges of Venezuela and the Northern Range of Trinidad, and bounded on the south by the Guayana Shield. This Guayana shield supplied fine-grained clastic sediments, which with the subsidence, formed a regional negative gravity anomaly and growth faults. Oil and gas discoveries from the Pliocene Moruga Group include Teak (1968), Samaan (1971), Poui (1972) and Galeota. These fields are mainly faulted anticline traps producing from depths of 1.2 to 4.2 km (0.75 to 2.61 mi) subsea, with Teak possessing a hydrocarbon column almost 1 km (0.62 mi) thick. ^ a b Trinidad and Tobago 2011 Population and Housing Census Demographic Report (PDF) (Report). Trinidad and Tobago Central Statistical Office. p. 26. Retrieved 27 May 2016. ^ a b Pike, John. "Trinidad & Tobago - Religion". www.globalsecurity.org. ^ "List of Postal Districts". TTPOST. TTPOST. July 29, 2018. Retrieved July 29, 2018. ^ "Trinidad: The Land Of The Hummingbirds - Epicure & Culture". epicureandculture.com. 15 May 2013. ^ Hart, Marie (1972) . The New Trinidad and Tobago: A Descriptive Account of the Geography and History of Trinidad and Tobago. London and Glasgow: Collins. p. 13. ^ Besson, Gerard (2000-08-27). "Land of Beginnings – A historical digest", Newsday Newspaper. ^ "Railroad Map of Trinidad". World Digital Library. 1925. Retrieved 2013-10-25. ^ "Trinidad and Tobago - People, Culture, Map, & Flag". britannica.com. ^ "Trinidad and Tobago -Known as "the Rainbow Country," the twin island nation is home to people of African, Spanish, Chinese, British, French and Syrian descent". caribtourism.net. ^ "Trinidad and Tobago Demographics Profile 2018". www.indexmundi.com. ^ "Trinidad and Tobago". state.gov. ^ Brereton, Bridget (6 June 2002). "Race Relations in Colonial Trinidad 1870-1900". Cambridge University Press. Retrieved 2 August 2017 – via Google Books. ^ "Trinidad French Creole". Une.edu.au. Archived from the original on 28 March 2010. Retrieved 2 August 2017. ^ "Trinidad and Tobago: Events & Festivals - TripAdvisor". www.tripadvisor.com. ^ "Trinidad & Tobago celebrations & festivals - Discover Trinidad & Tobago". discovertnt.com. 21 January 2015. ^ "Trinidad & Tobago Festival & Holidays". www.tntisland.com. ^ "UWI Zoology Museum - The Department of Life Sciences". sta.uwi.edu. ^ "Bats of Trinidad". TriniBats.com. Retrieved 2016-11-27. ^ "Zoological Society of Trinidad and Tobago Inc. - Official Website". www.zstt.org. ^ "Trinidad and Tobago". www.gecf.org.